Bob Geldof is furious with the BBC for reporting that his charity unwittingly funded weapons for warlords. So what's the truth? Here Band Aid's man in Ethiopia tells his disturbing story. The images of starving children flickered across the screen - youngsters hardly conscious, possessing not even the energy to bat away the flies descending on their emaciated bodies. BBC broadcaster Michael Buerk described the scene in Ethiopia 1984 as 'the closest thing you get to hell on earth'. The famine pictures awoke the conscience of the world. A year later, Britain was host to the biggest fund-raising event of all time, Live Aid. Who can forget it? At Wembley, and in Philadelphia, pop stars including Queen, David Bowie and George Michael were part of a dazzling line-up determined to feed the world. Money poured in. The 16-hour rock concert on July 13, 1985 raised around £65million and was watched by a global audience estimated at 1.5 billion. It was a moment of hope. But that was then. Now the BBC has reported that substantial amounts of money - some of it raised by Band Aid - were siphoned away from relief efforts and went to fund guns for Ethiopian warlords during the Eighties. Bob Geldof has responded with a vitriolic attack, dismissing the story as 'total b******s' and accusing the BBC of a 'total collapse of standards'. He has branded the BBC World Service a 'rotten old cherry'. So just what is the truth? And where did the money raised by Band Aid go? Today, for the first time, the Band Aid man on the ground in Ethiopia speaks out exclusively to The Daily Mail, saying he believes it is possible that up to 20 per cent of donor's money went to fund the rebels. Furthermore, he told me that he personally sympathised with the rebel cause he calls 'a liberating force', and travelled in convoys he suspected were transporting arms to them. John James was Band Aid Field Director in Ethiopia from 1985-91 and was awarded an MBE for his charity work. He says: 'I would be surprised if it were any less than 10-20 per cent of funds were diverted to the rebels. James, a farmer who is now 85 and living in Devon, adds: 'I think it is ridiculous for anybody to claim that not one penny of aid money was diverted. Aid money: Was Max Perberdy fooled by Gebremedhin Araya and Tekleweyni Assefa? To understand just how explosive his recollections are, let us turn to the BBC report that unleashed Geldof's temper, and caused ripples of alarm to reverberate around the world of charity fundraising. Former rebel leaders told the World Service's respected Africa editor, Martin Plaut, that they posed as merchants in meetings with charity workers to get aid money. They say that their organisation, the Tigrayan People's Liberation Front (TPLF) used the cash, meant to pay for food for the starving, to fund attempts to overthrow the government of the time in a bloody civil war. One rebel, Gebremedhin Araya, estimated that $95 million (£63m) of aid money from Western governments and charities, including Band Aid, was spent on weapons and the political machinery of the rebel party. He believed just $5 million (£3m) was used to help locals. James agrees with Araya that some money found its way into the rebel's hands - but denies it was the $95 million quoted. He believes that there is a 'strong probability' that five to ten per cent of funds was diverted for arms by the TPLF, and a further five to ten per cent used by them to finance their political 'hearts and minds' campaign - totalling up to 20 per cent. If this is the case, by his own estimation, about $2m of aid money was misused. So just how did Band-Aid money, given in such a wave of goodwill, come to fund guns? At the time, the Ethiopian government was fighting rebellions in the northern provinces of Eritrea and Tigray. It was the height of the Cold War. The Soviet Union, aided by Libya, poured $4billion into Ethiopia, sending 600 T-62 battle tanks to help the government fight rebels. Dozens of giant Antonov An-22 military transport aircraft arrived, delivering a mighty war-chest of fire-power. The communist leader Mengistu Haile Mariam - later found guilty of genocide - embarked on The Red Terror in 1977. He burnt rebel villages, and thousands were herded into churches which were set alight in appalling scenes of brutality. Women were systematically raped, and the streets of the capital Addis Ababa were littered with the corpses of hundreds of child victims. The rebels fought on - but they were out-gunned. They were kitted out with old Italian World War II machinery. Then came the famine and huge amounts of Western aid arrived. Much of the countryside, where it was needed, was under rebel control. Some was in the form of food, some as cash. 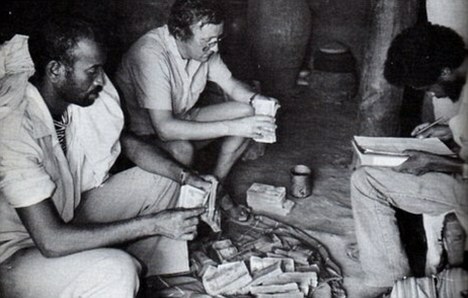 Max Peberdy, a charity worker from Christian Aid, carried nearly $500,000 in Ethiopian currency across the border in 1984, which he used to buy grain from merchants. His story is central to the BBC claims. He insists the money he carried fed the starving. But the merchant Peberdy dealt with was Gebremedhin Araya - who claims he was, in fact, a senior member of the rebel TPLF. 'I was given clothes to make me look like a Muslim merchant. This was a trick for the aid workers,' says Araya. Taking advantage of the fact that the aid workers conducted just a random sampling of the grain bags purchased, Araya placed sacks filled with sand under the grain. He says he handed over the money to his leaders, including Meles Zenawi - now Ethiopia's prime minister. Zenawi refuses to comment. Former TPLF commander Aregawi Berhe supports Gebremedhin's version of events. Now living in exile in the Netherlands, he says the rebels put on a 'drama' to get the money. 'The aid workers were fooled,' he says. A candid black and white photograph from the time has come to light, graphically showing the set-up. There is Peberdy - the cliche of the sandal-wearing foreign aid worker - opening a satchel full of Western cash, which is being counted by Araya and Tekleweyni Assefa, director of the Relief Society of Tigray (REST) - a group which was, in effect, run by the rebels. BBC correspondent Rageh Omaar worked in Ethiopia in the early Nineties. He confirms the situation: 'REST was undeniably the humanitarian wing of the rebel movement. Of that, there is no doubt. The BBC says that Band Aid's accounts show that it gave almost $11million to the society and other groups close to the rebels. The CIA, in a 1985 report, also alleged aid money was being misused and 'diverted for military purposes'. Plaut, who reported from Africa in 1985, spent almost a year researching the documentary, and the BBC is standing by his report. For its part, the Band-Aid Trust has said it will report the BBC World Service to Ofcom and the BBC board of directors. Eventually, the Trust passed on accounts dating back to 1995. The files for the previous decades are archived, they say, and not available for some time. They could perhaps then be viewed - at a cost. In fact, the Trust proves elusive on every point - it does not have an office, questions have to be put, through its accountants, in writing to the trustees, who will decide if they deign to reply. They do not reply. Hardly the transparency expected of a major UK charity. After the extraordinary success of Band Aid, Geldof pledged to spend 20 per cent of the money on emergency relief, 20 per cent on logistics, and 60 per cent on long-term development. Around £43 million was spent in the first year. Despite scrutiny and the efforts of charity workers in the field, it would have been impossible to account for every pound. In the years up to 1992, some £100 million was raised and spent. So just what do the accounts show since 1995? Band Aid has made a large number of grants to different organisations. Its stated aim is the relief of hunger and poverty in Ethiopia and the surrounding area. In 1995, it gave £231,808 to SOS Sahel, a development agency that works with herders and farmers in Africa. The following year, Farm Africa received £25,000 and Oxfam £100,000. In the years to date, grants of up to £500,000 have been made to charities including Christian Relief & Development Association (an Ethiopian charity), UNICEF, Sudanese Relief and Water Aid. A total of £75million was handed out up to 2004. 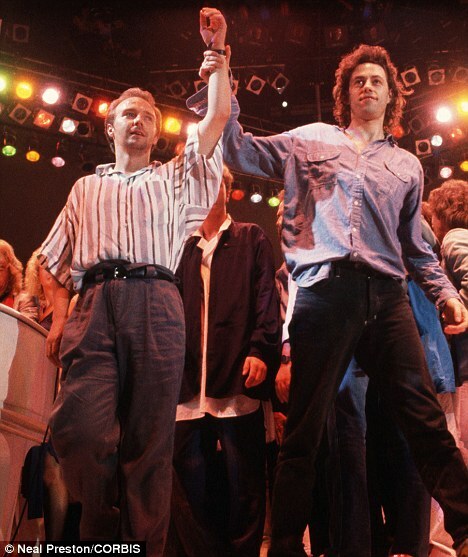 Towards the 20th anniversary of the concert, Band Aid experienced something of a renaissance. The charity set up a trading subsidiary Woodcharm Limited, to handle royalties from a re-released DVD of the concert, and an auction of signed instruments donated by Band-Aid members. Now, however, the charity is under fire. The aid agency world is understandably upset at the row - not least because tales of aid money paying for arms could cause donations to decline. 'If we were being conned, I think it was on a very small scale,' said Stephen King, who oversaw charity work in the region at the time. Christian Aid has also refuted the allegations. Others disagree, however. Richard Dowden, former Africa Correspondent for The Economist and director of the Royal African Society, tells me: 'I would be astounded if some of the money had not been used by the rebels. That is what happens in these situations'. Indeed, the UN reported last week that up to 50 per cent of food aid in neighbouring Somalia is being stolen. Perhaps, then it would have been wiser for Geldof to have been more measured in his response to the claims. David Anderson, Professor of African Politics at the University of Oxford, says that it is naive to claim no money was diverted by warlords. 'You can't work in a warzone without some risk that you are giving money to some of the bad guys,' he says. He believes Geldof was upset because news reports of the BBC programme have made it sound as if 95 per cent of money raised by Band Aid was diverted by rebels. 'Of course, that is not true,' he says. 'The programme claims a proportion of the money going into a small area of Ethiopia was diverted to buy arms. They claim that as much as £7million went astray. Now, John James has brought us far closer to knowing the truth. Whether Bob Geldof will eat his hat - and keep his promise to sue the Ethiopian government - is another matter.